After my son was born I couldn’t sit for six weeks. Labor was difficult, there were complications, and recovery was long and hard. If you’ll ask any postpartum mom, she’ll tell you how important it is to have comfortable surroundings in bed. It is a challenging time, when I simply wanted to go out, get air, but had to allow myself the time to recover. I needed to be able to sit up in bed for those that wanted to visit, without actually sitting as my body wouldn’t allow it. A pile of pillows seemed to cause more discomfort than comfort. The BedLounge is the perfect solution for the postpartum mom. It’s perfect for any mom, or anyone who likes to turn bed into a place to lounge. It is designed not only for comfort, but for back health as well! The BedLounge is luxuriously comfort, and designed by back experts. Layers of foam and fibers conform to your back, while still providing ample support. The BedLounge is brilliantly designed to support your back and neck in different positions. It has supportive armrests so that your back can take it a little easier. 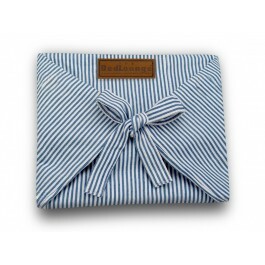 While it is huge, and totally envelopes you, it is still lightweight and easy to carry around. BedLounge also has slipcovers in an awesome variety. They are top quality and very beautiful, with detailing and accent buttons. The slipcovers can be removed and are machine washable – so that you can treat it like you would your bedding. Pockets on the sides allow you to slip in an extra book, your phone, and your glasses. I need not tell you how many times I had to frantically search for my glasses because I did not have where to put them while reading. Made of layers of down, quality resilient foam, and fleece combed fibers. 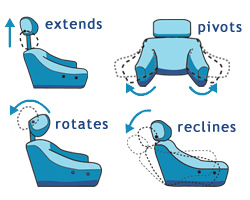 Headrest rotates, and slides up and down, so that it will suit your needs whatever it is. Removable lumbar support pillow slides into a pocket in the slipcover. Adjustable sides help distribute and take the weight off your head, neck, and shoulders. Patented “active frame” is designed to allow the key parts to conform to your body shape. Deep pockets on the armrests hold everything you need. 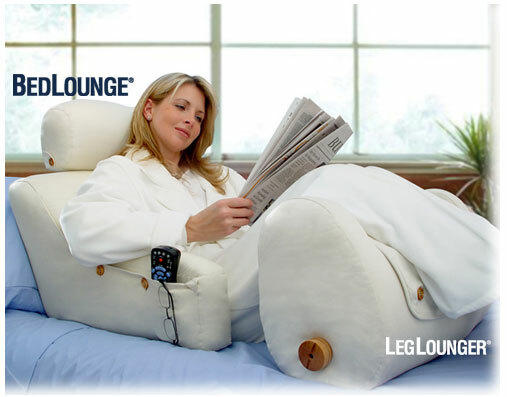 The BedLounge is a perfect gift for a mom, whether a new mom or a veteran mom! It is revolutionary and the best of its type. The various designs blend right in to your decor, and the superior comfort is just what every mom deserves! I have leg problems, and have been wanting to try something like this for a long time now. Thank you for the review! This looks a lot more comfortable than the two pillows I currently use! Oh my gosh this looks like a dream come true! I am with you my pillows flatten out or just slide making me more uncomfortable but this looks amazing to take some of the pressure of and relax! Awesome, This would be wonderful for watching TV, Its so uncomfortable just using pillows. Wow, this looks amazing! I would love to read in bed more comfortably, and it would help so much with lower back issues. This looks heavenly for bad heartburn nights, reading in bed, and definitely for pregnancies! I would have LOVED one of these when I was pregnant with my son! What an amazing product! It looks so comfortable and would be perfect for reading in bed…I really want one 🙂 I like the adjustable headrest and the lumbar support pillow! Those deep pockets are a great feature, and I like the removable, washable slipcover! oooh that looks so comfortable…I want one! I would love to be able to get this for my Mother-In-Law, she’s bed-ridden and this would be great for her. I have back issues and even many pillows isn’t comfortable in bed. And sometimes I want to sit in bed on weekend mornings and read a book or newspaper with a cup of coffee. I love how the bedlounger is adjustable and made by back experts! I love the fact that it helps with the redistribution of weight. It helps that one point of your body will not develop trigger points. This looks very comfy!!!! Would be awesome for watching movies on my ipad! I love that it can extend and pivot. It looks so comfy. Wow! This sounds woderful. I broke my neck and use a wheelchair. I have tried everything to find comfort in bed from new mattresses, pillows, bed rests. This sounds amazing!!! Super cool, I love it! This thing looks AWESOME!!! It looks so cozy! I would love to use while reading a good book! I like that the cover is washable. What an awesome product – and just the thing to ease my chronic neck pain and provide the support I need to read or watch TV in bed! Thank you for informative review and photos. This looks like an amazing product. I alway have to sit up against the wall and it hurts my head and my back. This would be a better alternative. This would be so much better then leaning against the wall like I do now!! I would love this!!! nice … very adjustable … must be very comfortable! Oh this would be perfect for my old mom! She spends most of her time in bed, and is always so uncomfortable. I know she’d love it! I do love the way the headrest is adjustable, up/down, and it rotates, too. It’s all customizable! I love this it would be so comfy especially when i want to sit and read a book. This would be the perfect thing for my bad neck and back. I can never seem to get comfortable when I’m sitting, so I can’t read for very long, and I’m constantly moving around trying to find a comfortable position. The rotating, pivoting features make this the perfect solution for me. I love the leg lounger too. I am currently 7 1/2 years postpartum and I still want this! I need this! I am putting this thing on my Christmas list if I do not win it! It looks awesome! Hi, was just gonna say the twitter follow for @ashabutterflys says page doesn’t exist- I believe it’s because the ‘r’ is missing, but since I was all ready following @ashabutterflys (I went back and checked to make sure) I took the entries for it on the Giveaway! Thanks, really cool product! I love big comfort and functionality in bed accessories, and I can not lie! What a comfortable way to watch t.v. or read in bed! I’m 37 weeks pregnant and planning on nursing, so this looks amazing! I like that it reclines and has the option of a leg rest also. Oh my. I would love to get this for my husband. He was in a terrible accident breaking 22 bones and massive nerve damage that never healed. He can’t lay down and he has to have his foot up by five pm or he is in extreme pain. So he sits in a recliner after work until he gets up for work in the morning so he can lift his leg. This would help him be able to get into a bed again. This looks outstanding and would help with the lower back pain. I love that this is so adustable, it is just what I need. I also like that the slip cover is easily removed for washing. I always have trouble getting comfortable when I try to read in bed. Have so many pillows for my neck and shoulders and then several under my legs but nothing works and I usually give up on my attempt at comfort almost immediately due to pain and discomfort. This could be answer I am looking for. This looks so comfy to use. This would be great to have. I absolutely love this bedlounge! I have never heard of it before this giveaway. I am very excited that it reclines, and pivots and moves all over. Looks like something I could definitely use, for sure! Also looks very comfy!!! That chair sounds wonderful. Especially for post-op patients that have trouble getting around, or as you mention. just getting comfortable. I like that the head rest extends upward, and I especially like that the cover is washable!! !